Japanese for Young People is a new three-level series designed primarily for junior-high and high school curricula, encouraging systematic Japanese language acquisition through an enjoyable but structured learning process. The student books introduce the building blocks of grammar through key sentences, dialogues, exercises and activities. 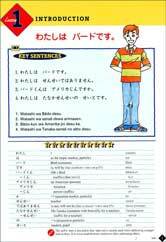 Workbooks contain hundreds of exercises and games to help with the written language, while tapes provide natural, native Japanese. From the authors of Japanese for Busy People. Below is the first page of Chapter 1.